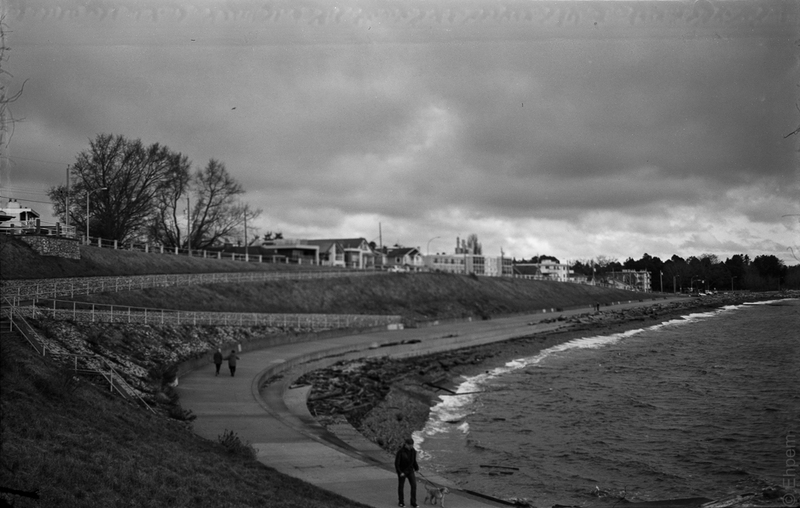 The Erno shoots 6×9 cm negatives on 120 film. It has a single aperture of f10.5, a “B” (bulb) setting and an “I” (instant) setting that appears to be about 1/30th second. The aplanatic lens has a focal length of 105mm and seems very simple though there might be more than just one piece of glass, separated by air. The bellows have only one position when extended so the camera is fixed focus. The viewfinder rotates for landscape and portrait orientations but is small and difficult to use, even though this one is still quite bright. There are tripod mounts for both landscape and portrait orientations, and an inlet for a cable release to fire the shutter. The shutter release is on the top right of the lens when holding the in portrait mode and works well in that orientation. In landscape mode it is difficult to press the shutter all the way. Several more photos taken with this camera on my 52Rolls post here. I believe that this camera is variant the first version that is described here. The differences are that it has no English wording on it, the rewind knob has unbroken knurling, it does not have the folding frame-finder on one side (there is no evidence that one was removed), and there is no rivet or decorative lump on the bar beneath the lens that is used for releasing the bellows when locked open. The frequent presence of English on these cameras and the style of rewind knob seem to be the main lines of evidence that this camera came into production after WWII. I am not familiar enough with Bencini cameras to know what all the earlier rewind knobs look like but I have seen pictures of some early 1940s models such as the Etna which has a rewind knob identical or at least very similar to this one. The Etna also seems to have a plain bar beneath the lens. In other places there is uncertainty about when the Erno was produced with conclusions of probably early post-war. In this video (with 7:49 left to play) on Facebook the camera is dated to 1939. Perhaps this camera is an early version, either intended for non-anglophone markets or even a pre-war or WWII version. Some differences that it has from the other Erno’s that I can find described in enough detail are similar to the Etna which may have been produced only from ca 1940-1942 and to an early variant of the ICAF Delta. EDIT: I sent this information to Donato Consonni the author of the Bencini History website. He agrees with my observations about the dating of this camera as possibly early 1940s, and was interested to see photos of another one I had come across that sold in Saskatchewan in 2011 as something in between my camera and what he described. In addition, when discussing my camera with another Bencini collector, that person showed him yet another Erno variant. Consequently, he has amended his website with a new page that includes my photos and pictures of the other new finds, and a table of features and possible dates – this camera is Variante A1 on the table, the Saskatchewan sale is A2. You can find that page here. 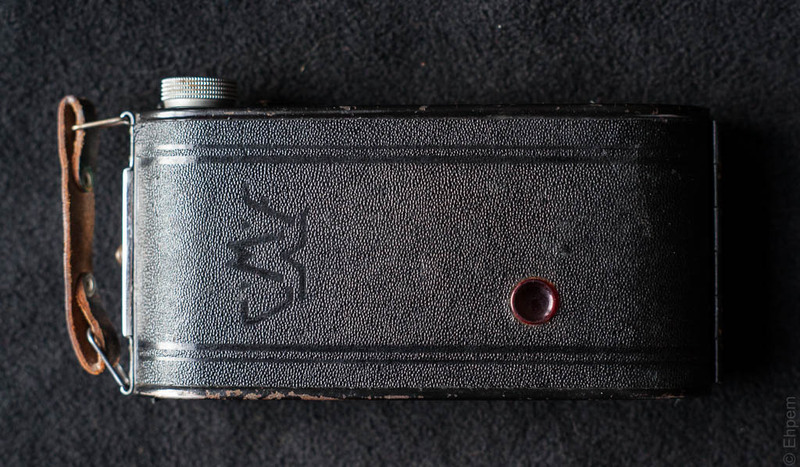 This camera has a few problems – a bit of surface rust where the black paint has peeled of, a slight lifting of the paint on the pressure plate, probably from underlying rust, slight scuffing and edge lifting of the leather covering and so on. The biggest problem is that one of the brackets that holds the bellows open is detached from the frame of the camera and I don’t think it can be reattached without removing the bellows. Otherwise, it works as it should – the bellows are light tight, the shutter fires properly and it makes pictures. There is a bit of dust inside the lens that suggests a two part lens, though perhaps one is just a glass cover. I will see if I can get at that to clean it, but not if it is going to be tricky. The back of the camera is a bit loose when closed, but does not leak light. All in all in good condition. To open larger images from the gallery click on any image below and the navigate with the arrows to the others. Bencini CMF Erno photo made with Ilford XP200 400, expired Nov 1997, commercially processed, scanned at home. Hi, i have the same camera for sold with leather bag. Hi Guillaume thank you for commenting – much appreciated. I have removed your email address from the comment as I was not sure if you wanted it made public, or if you were soliciting offers for your own camera through my blog (I don’t allow advertising in my comments section). I am not in the market for an Erno and indeed I will sell my one if someone makes me the right offer. If what you intended was to contact me about such an offer, my email address is on my about page and I would be interested to hear from you. 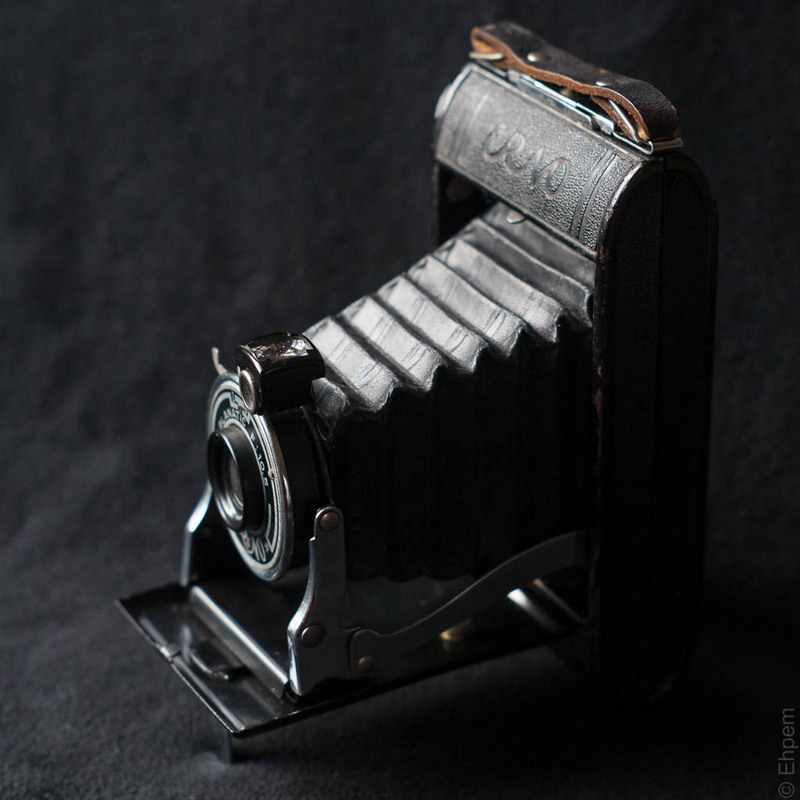 what a nice old camera, utterly basic, no fiddly adjustments, and with the bellows folded quite portable. Viva Italia! Thank you Mario. I don’t know why people call the more recent versions of cameras with these same capabilities (like the recently deceased Holgas and the Dianas and so on) “toy cameras”. They are only toys in the sense that they are fun to play with. If one masters and works within their limitations, then very good pictures can be taken with them.